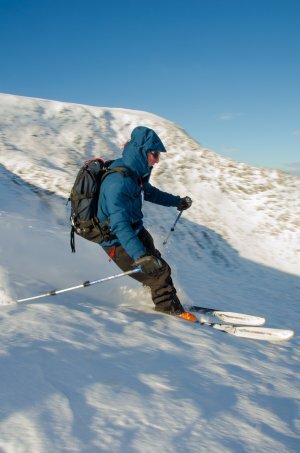 This course is aimed at people either with some skiing experience who wish to learn the additional skills required for ski touring, or at those who already have experience but are not familiar with the best spots for good snow in the UK hills, something which is often based on local knowledge and can make a big difference to the success of a days touring. We can run this course in Scotland, either the Fortwilliam or Aviemore areas often proving reliable, or occasionally in the Lake District when conditions are good, something that is an amazing experience when we have the snow here! We will often update the Blog when the skiing conditions are good in the Lakes as its a case of moving quick before it goes. All technical equipment can be hired if required at an additional cost. Note – We run Ski Touring courses at a 1:4 instructor client ratio max. We can supply additional instructors for larger groups wanting Ski Touring.